Essex Garden Care provides high quality cultivated turf and soil supplies including screened topsoil, freshly cut cultivated turf, lawn removal, and replacement, professional lawn laying, and turf and topsoil delivery in Southend and South East Essex. Our turf is grown using premium quality seed cultivators, which ensure that the grass displays the ongoing health and is resistant to disease. All turf, when supplied, is freshly cut and ready to be laid, minimising the time from cutting to being laid on your lawn will reduce the chances of the turf failing to take on a lawn. We offer complete turf laying services, by removing the old grass and weeds, levelling the area where the turf is to be laid, re-laying new lawns and making sure they are embedded correctly. You will find that with our high quality, uniform finishes our turf is suitable for most domestic and commercial landscaping projects. Screened – 1cm sand based topsoil, which is suitable for seeding and turf laying. Priced at £49.00 per ton plus VAT, we deliver up to 3 tons at a time. Delivery costs will vary depending on distance away from Southend. Ecosoil – This is exactly the same as the screened soil, except there is roughly 30% shredded compost incorporated, all sieved to 1cm. 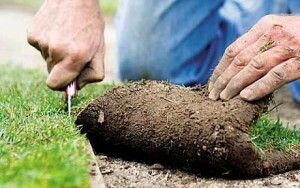 This can be used for final surface turfing or seeding, but we would not recommend it used to a depth of greater than 2” as the compost may start to degrade and could lead to the lawn sinking. It is most suitable to have the ecosoil in raised flower beds and vegetable patches because of its capacity to be able to hold water and its very workable. Cost is £59.00 per ton, delivery costs depending again on the location to our yard. Lawn Dressing – Each bag is 0.8m2 or about 1 ton in weight, it costs £100 plus VAT each yard and delivery is subject to distance involved. We are also able to arrange larger quantities: 8-28 ton loads of soil, these will be individually priced, based on soil type quantity and destination. Contact us with your query on our contact page. For more details of our services, please go to our garden services page.